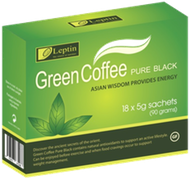 Leptin Green Coffee Pure Black is a drug free, instant style beverage containing a blend of herbal extracts to support an active lifestyle. The extracts used in this product have been sourced from far reaches of the globe to make this unique and all-natural herbal green coffee and green tea formula. Specific ingredients are used in this formula, including coffee beans containing chlorogenic acid and antioxidants, antioxidant rich green tea leaf extract, energy rich Panax Ginseng and the body tonic Aloe Vera extract. Once per day, dissolve the contents of one sachet into a 200ml cup of boiling water 15 minutes before breakfast. May add low fat milk and or sweetener to taste.